This holiday season is dedicated to the appreciation of the things that matter most, and this celebration of family, friends, food, and adventure comes hand in hand with living in the moment. The perfect way to illustrate this passion for the present is by leaving the denizens of the material-world behind and spending time in the great outdoors. Whether it’s through hiking, running, climbing, paddling, or just breathing, stepping outside for a moment each day can truly remind a person of what is important. This Black Friday, many stores around the nation are closing their aisles and opening their doors to adventure. After giving thanks, Americans spend their evenings trampling over each other in order to reach the best sale. Outdoor store, REI, is fighting the madness by closing all 143 of its stores this Black Friday. CEO, Jerry Stritzke, is not worried about closing the store on the “Superbowl day of sales”, because he wants to promote the company’s philosophy of exploration and adventure, as well as remind people to appreciate the truly meaningful things in life. 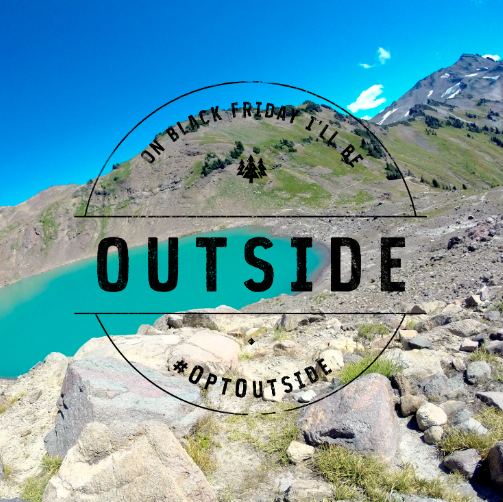 REI is encouraging not only its employees, but its customers to #OptOutside this thanksgiving weekend. The popular hashtag #OptOutside has spread across the internet, inspiring people to recall the true spirit of the holiday season. People across the country have shown their support by creating and sharing their own #OptOutside images. REI is behind the concept, and is encouraging people to share their Black Friday plans with the world. Create your own #OptOutside image here.